These multi-day, bespoke bicycle vacations involve leisure pedaling and immersive, on-own sightseeing. 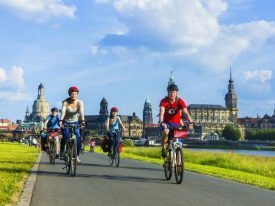 MANCHESTER, UK, April 11, 2019 – Freewheel Holidays, the UK specialist in European self-guided cycling holidays, offers itineraries in four former Soviet-bloc countries: Romania, The Czech Republic, Hungary and Poland. Freewheel is a division of Sports Tours International. To check trip availability, make reservations, or to find out more about Freewheel Holidays’ leisure cycling tours call +44 (0) 161 703 5823, email info@freewheelholidays.com or visit www.freewheelholidays.com.